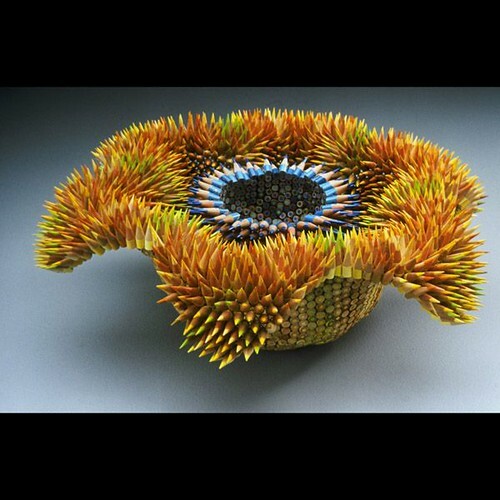 This is a sculpture made with pencils......amazing isn't it ? 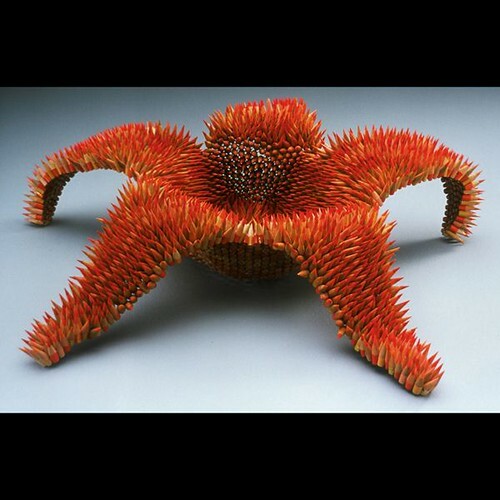 What fantastic creativity and talent to be able to come up with something this beautiful....Here are a couple more of these pencil sculptures. 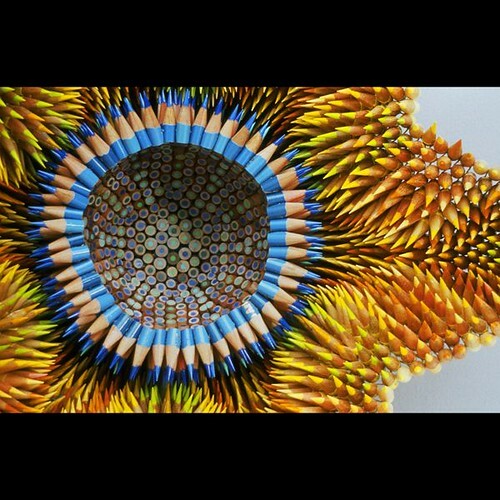 Surely, this artist has taken pencil art to a whole new level, right? I received these pictures in my mail and wanted to share these with my readers. Moving on to the reason for this post....cabbage roti. My food processor surprised me recently.....usually I use it for grinding, grating and making stuff like this oat and nut fudge, I have never used it to cut cabbage or other vegetables. But recently when I was in a rush and had to cut a great deal of cabbage, I was desperate enough to give it a try and found that it works in a pinch and it also cuts very fine. When I saw the finely cut cabbage, it struck me that I could easily use this in a roti and it would really work well. And since there is no better way to know for sure than to try it out, that is just what I did....and loved how it turned out. The cabbage adds a light crunch and texture to the roti that we thoroughly enjoyed. Both the Ajwain (carom seeds) and Shah jeera(caraway seeds) added a very unique flavor to the roti and the flax seed meal added an extra burst of nutrition. In a large bowl assemble the wheat flour, flax seed meal and all the spices, mix well. Add finely cut cabbage and mix it in with the flour. Add water a little at a time and knead to form a stiff dough. Add oil and knead for a few more minutes. Unlike other rotis for cabbage roti make the dough a little more stiff as the dough tends to soften because of the cabbage. Keep dough covered and let it rest for about 15 to 20 minutes. Knead again for a minute or so and divide the dough into equal lemon sized balls. Heat a griddle/ flat pan/ tawa. With the help of a little flour roll out the dough into a circle of desired thickness. Place the rolled out dough on the griddle/ tawa/ flat pan and let it cook on one side for a minute or two. Flip and cook the other side. 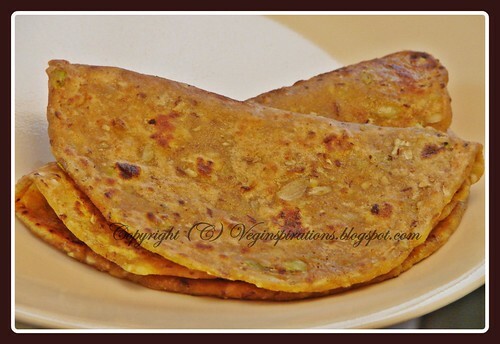 Apply a few drops of oil/ ghee on the top side of the roti and flip over and apply oil to the other side as well. Cook both sides for an additional few seconds until brown spots appear on them. Remove and serve hot with raita / or curry of choice. Yield will depend on the size of the roti. Balance of dough can be refrigerated for a day or two. In case you refrigerate the dough and find that the dough has become considerably looser, you can add a little more of whole wheat flour and re-knead it before using it again. Wonderful pics, thanks for sharing! Cabbage roti sounds new...bookmarked sure to try it out soon! i love cabbage, and i love rotis. i will definitely try this out. Wonderful pics.. thanks for sharing. Like the cabbage rotis, something different and delicious. Those pictures are awesome art work! Do i even have to say how I'm drooling over the Rotis? I love the addition of flax seeds to the roti. And amazing pics BTW. Cabbage roti sounds and looks delicious! Thanks for sharing those fantastic artistic pictures..
That is very creative.. i couldn't guess they were pencils at all. Cabbage roti with all those spices must be fabulous. I always like stuffed parathas. Very good idea Usha. I too was using my FP for shredding carrots/cabbage, but stopped now because of the clean up. But I do have a hand held grater which shreds as thin as the FP. So I can't wait to try this. Hi. The pics are amazing dear. I always make these parathas for lunch box as they are filling and nutritive, I liked your add of flax seed meal. Great thought. healthy roti..the first 2 pics are great.. can't believe those are pencils. Lovely pencil sculpture Usha, cant believe my eyes..such a great work..
Cabbage paratha looks fantastic and delicious!! Pencil art was somthing else..thanks for sharing. Like your simple recipe and if anything can reduce time for cutting veggies it a blessing. Different idea. Making rotis with cabbage. woo thts looks amazing usha...precious snaps...ur roti looks mouthwatering.. The first one is real crippy! The roti is fantastic! I was confused for a while...wndering did I really land at ur recipe blog' or diff' place...art work looks too good. Wonderful pics...never guessed it was all with pencils..I like the idea of cabbage roti...Would be a nice and healthy one for my son's lunch box ! Nice and healthy way to incorporate cabbage in rotis... that artwork is awesome! nice usha! cabbage is one of my favourite foods. i just recently made cabbage flax crackers - this sounds delightful! Those are really amazing pictures! Thanks for sharing them. Using those cabbage in a paratha is a great idea. I am going to make these tomorrow. Cabbage roti is definitely a healthy option. I have no idea what that picture is. Parathas look so so good. For a moment I thought it was a food art... made from the skin of jackfruits!!! Thanks for posting those pictures. What incredible pictures! Thanks for sharing... the recipe looks wonderful. lovely cabbage rotis very inviting with a nice picture. Love these rotis .. I make a different version of it.. will definetly try yours soon..
Cabbage rotis looks so good Usha. Tried this roti. Came out pretty well.